Remember I said a couple of weeks ago that winter isn’t over until winter is over? I rest my case. I did fall for the warm weather though and brought back plants from my brother’s garden in Poulsbo, Washington, to plant quickly in the garden. They are now going in a wheelbarrow full of potting soil in the basement. Oh, well. Let’s face it, though: Even when the weather does warm up enough for early planting, it is still going to be hard to get things going. One way around that is to cover your beds with temporary greenhouse structures that can capture sunlight and keep those small seedlings warm. These “greenhouses” go by several names including low tunnels, hoop houses and row covers and can be made of PVC pipe bent in a “U” shape and then covered with clear plastic or porous spun fabric. Some are just a couple of feet tall while others can be tall enough to walk in or even bigger if you have a big garden. Temporary greenhouses can add as much as a month of growing time to either end of the season. Set up a couple of weeks ahead of spring planting, they can help warm the soil by as much as 10 degrees, which will allow many vegetable seeds to germinate faster. Used to cover warm-season crops like peppers, tomatoes, cucumbers and squash through our cool June weather, they will allow the plants to grow quickly and be ready to flower when the warmer July weather arrives. Tomatoes planted under a low tunnel in my garden are twice as big at the end of June as their counterparts planted in an open bed. To build a temporary greenhouse over a raised bed, insert foot-long pieces of rebar about 8 inches along the edges of the bed, spacing them about 3 feet apart. Bend a 10-foot length of half or three-quarter-inch PVC pipe to fit over the ends of the rebar stakes. The stakes will keep the pipe in place even in windy weather. The pipe is then covered with either plastic or a spun polyester fabric (floating row cover). The fabric is cut long enough so that the ends can be gathered together and tied to a stake at each end of the row. So which cover do you use; plastic or fabric? Clear plastic is less expensive but not as durable as fabric. Fabric also allows water, air and light in. Ordinary clear plastic deteriorates in the sunlight and can get too hot for the plants unless you roll the sides up. Keeping plants watered under plastic is more of a challenge. There is ventilated plastic sheeting available online that solves some of this problem. You can also buy UV stable greenhouse plastic, but it is more expensive and will likely have to be ordered online. 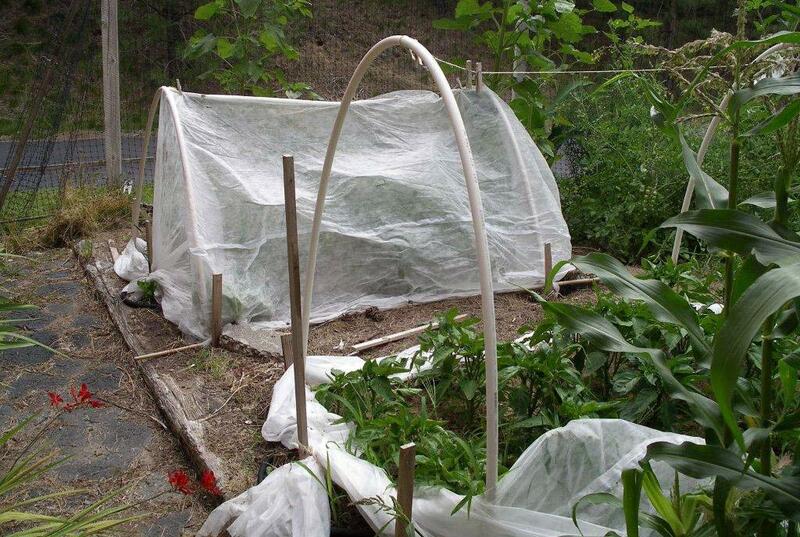 Whether you use plastic or fabric, once the weather warms, the cover will need to be removed to allow for pollination.